Kingdom Hearts 3D's gameplay is where things really shine. Among a few other enemies and obligatory boss fights, the player will mostly be fighting the aforementioned Dream Eaters. There are a variety of physical attacks and combos to dish out, as well as upgradeable magic attacks. 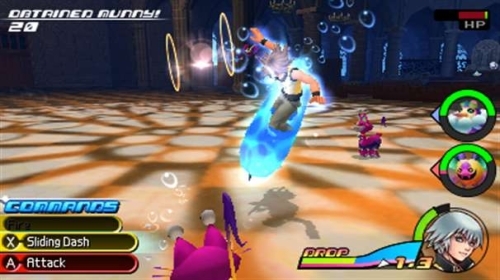 New to the series is a technique called “Flow Motion,” allowing the player to alter time and space to dole out the most damage possible. Flow Motion is where things get ridiculous; having the player fly around the screen at unimaginable angles and speeds is really cool. It's quite fancy, and the game boasts some top-notch programming that ensure each Flow Motion attack hits at least one enemy.Combat can get pretty white-knuckled at times, and sadly, the game's camera struggles to keep up when not auto-targeted on an enemy. The camera is controlled with the L and R buttons, which isn't the most efficient way for fast mid-combat camera angle changes, but Square Enix definitely tried their best to make do. For lucky Circle Pad Pro owners, the camera is no issue whatsoever, and isn't limited to horizontal rotation. Special combat commands, such as magic, strong physical attacks, and items, are delegated to the d-pad, which can also be somewhat frustrating in the heat of battle. As the d-pad is located right under the circle pad, the player is usually too busy moving to comfortably choose a special combat command on the fly. It's doable, but certainly awkward, and can often lead to getting hit by attacks.Exploring the overworld of each area brings a mixed air of gorgeous visuals, a feeling of isolation, and more random encounters than Mount Moon. The visuals for each Disney area are faithful to the source material, and the voice acting is superb. Kingdom Hearts 3D definitely pushes the 3DS as far as it’s been taken graphically, and each world contains tons of nooks to explore for treasure. That said, the only NPC’s in the game are main characters from each respective Disney movie, and even then they’re only present during cutscenes. This leaves each world feeling incredibly barren, save for the countless battles one will be partaking in. As much as the combat system if praised, it still feels like there’s a bit too much of an emphasis on the combat… Disney movies are great sources of inspiration for a game, and it feels like not enough creativity was exhausted for each world. Again, the game is gorgeous, and each cinematic tells a beautiful tale regarding each movie, perfectly entwining the Kingdom Hearts characters. Each world is complimented by top-notch orchestral scores that live up to the expectations set by previous titles, and the voice acting is definitely quality. Even characters from movies where the original voice actors have long passed away are supported quite faithfully, Pinocchio and Jiminy Cricket being the most notable examples. 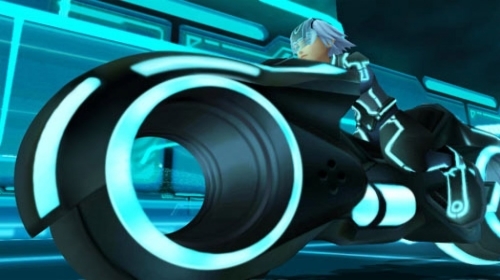 Another welcome addition to the franchise are Spirit Dream Eaters, friendly alternatives to the baddies making up each Disney location, and aiding our protagonists in the fight. These Dream Eaters have taken the place of the party members of previous entries, and each have their own advantages in combat. Defeating the evil Dream Eaters gives the player various materials to craft Spirit Dream Eaters, and recipes for more spirits can be purchased as well. The mechanics surrounding these concepts can get incredibly addicting, as the player can take a break from normal game play and hang out with each spirit in a fashion similar to Nintendogs. This involves tons of minigames, feeding the spirits, and petting them, all to make each spirit’s Link Points, or LP, higher. What’s great about this is that the spirits actually level up both in combat, and through these secondary minigames, and it really is quite fun making one’s pet the best it can be. Scouring the overworld for specific materials to craft the strongest Spirit Dream Eater is sure to be a draw for players seeking for the most hours out of their cartridge, and it’s payoff in battle is worth the effort. Alas, every rose has it's thorn, and this Kingdom Hearts bouquet has the “Drop” system, hence the Dream Drop Distance of the title. 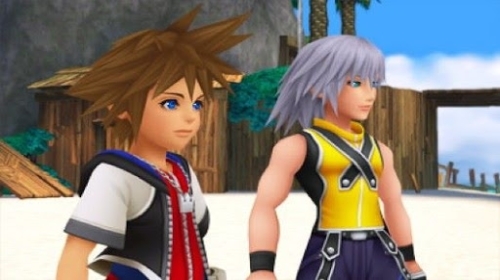 As the player progresses in the game, every half hour or so the player is forced to switch between Sora and Riku. The game doesn't take into consideration what the player is doing, thus a drop can happen anywhere, anytime. This can get the player into a fervor of hair-yanking if the game decides to drop during a boss fight, in which case the boss will have regenerated all of it's health, yet any items used during the boss are gone. During the play-through for this review, this happened on several occasions, thinking that there was enough time for the boss fight yet dropping mid-battle anyway. For some of the tougher bosses, this can be one of the most horrible things, having stocked up on potions beforehand only to have them lost with the boss completely healthy. Granted, the drop system allows for the player to progress as both characters and experience each storyline concurrently, but a better system could have been implemented, even something as simple as the drop gauge pausing during a boss battle would have been an improvement. All things considered, one would be hard pressed to find anything on the 3DS that is even remotely close to the experience Kingdom Hearts 3D has to offer. Hours of gameplay, addicting combat, a sweeping narrative, and of course, the Disney brand name are what put this crossover on the map some 10 years ago, and Kingdom Hearts 3D is no exception. Hack-and-slash RPG goodness that finally gives everyone a reason to slap their 3DS into that dusty Circle Pad Pro. A console grade experience with some great experimental additions to the franchise, even if the Drop system leaves much to be desired. Opening with a cinematic set to an orchestral score of series hit “Simple and Clean” sets the bar high, and stays there for the most part. Wonderful voice actors stay true to the source material, and the audio quality overall is brilliant. Definitely some of the best seen on the 3DS yet. The game was originally announced way back in 2010, and the time between then and now was certainly well spent! The 3D isn't anything special, but playing with it on adds a cool sense of depth and clarity. The Circle Pad Pro is an absolute must for the camera work, as busy battles result in frantic camera rotation that simply can't keep up when delegated to the L and R buttons. The combat, on the other hand, is nigh-flawless. The variety of combos and special attacks all work great thanks to the well-implemented auto-targeting. Kingdom Hearts 3D is a wonderful experience with boatloads of hours waiting to be spent. Don't let the confusion surrounding the series be a reason to miss such a quality title. 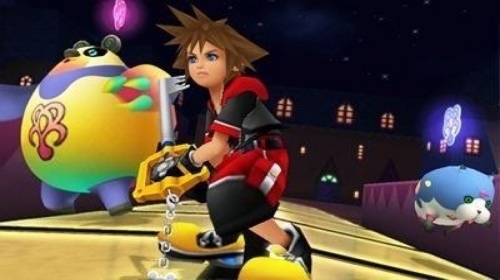 Winter Spectacular 2.0 - Day One: Win Kingdom Hearts 3D!